Have you been searching for a professional business to carry out your Painting and Decorating in County Antrim or the surrounding areas? 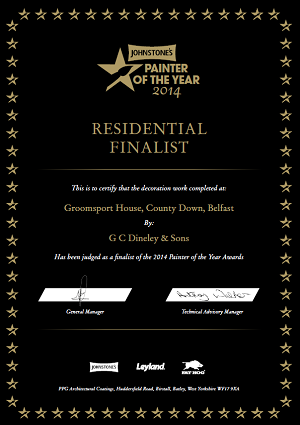 With many years of experience in the painting and decorating business, you can trust GG Dineley and Sons to provide you with a first class painting and decorating service. For your peace of mind we will only employ fully qualified staff to carry out work on your properly that is why all of our painters and decorators have C.S.R. qualifications. We have also achieved our safety qualification through Safety Cert and currently hold both public and employers liability insurance that safeguards both our clients and employees. We are a long established firm and have a large following of repeat customers due to our excellent reputation in the local area. We take care to ensure that all of our work is completed to a high standard. Our business has been built up from word of mouth recommendations due to our excellent standard of services, so come to GG Dineley and Sons when you want a commercial decorator in Belfast. For any additional information please do not hesitate to contact us on 028 91877 389 or by visiting our Contact Us page.